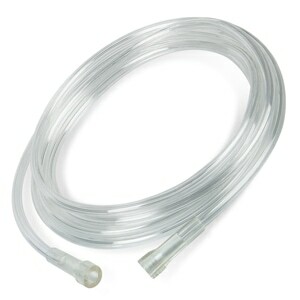 These AirLife Swivelling Oxygen Supply Tubing Connectors will connect any two lengths of oxygen tubing with standard 5mm to 7mm end connectors. The swivel action of these connectors helps prevent kinks and snags in tubing as it moves around on floors and bedding. 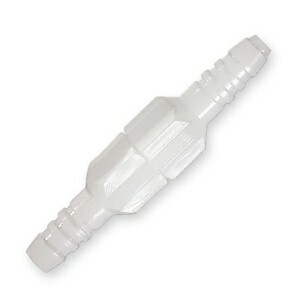 These connectors are compatible with all Oxygen Supply Tubing available on this site. My contact with your company was one of the best both online and by phone. Thanks for you help. I bought this product because I thought it would be the best swiveling O2 supply connector since it was more expensive than the other swivel connector. I ended up switching back to the cheaper one which by far works much better. Great service, Great list of related product! 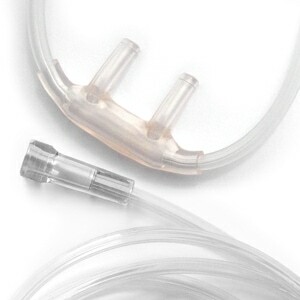 These swivel connectors have an opening that's just a bit wider than the "threaded" type, allowing more oxygen to come through the tubing and into the cannula. The item does not fit into the tubing for the cannula. THIS SO CALLED SWIVELING CONNECTOR WAS SO STIFF. ALL IT WOULD DO IS KEEP TWISTING THE HOSE. Great for not a lot of kinks. Connecter turns but doesn't swivel. Can connect tubing if you don't want swivel. Useless as a swivel connecter. I was very satisfied with the delivery time and the quality of the products. Nice swivel. It does help keep tubing from twisting. It could be even better if it swiveled more freely. This product is a must for any length of tubing. Not pleased. The swivel is too tight. Doesn't perform any better than standard connectors. Very disappointed. Would not recommend. This connector doesn't connect well and doesn't swivel well. It is difficult to attach, comes loose easily and doesn't prevent the tubing from getting twisted. I have used your company for my tubing needs and like everything but this product. 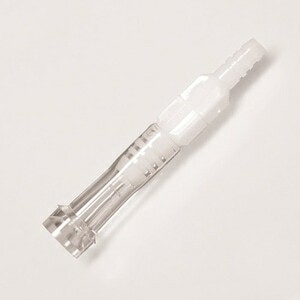 The whole purpose in buying a swivelling tube connector is so that it will swivel--reducing tangles in your oxygen line. It DOES swivel, but it is stiff so it doesn't do what I wanted it to do--other than connecting tube-to-tube. I do have another swivel connector which is a better quality but this does work good. For now I will use it as a backup. It always keeps my tubing from twisting. Excellent customer service, friendly and professional. Fast shipping and delivery. You have to keep an eye on it, because it comes apart so easily! I have gotten into the habit of walking with the connector in my hand just to make sure, but it does seem to help with all the hose tangels. These are not worth the price. They are stiff and do not easily swivel. They are unusable. Gr8 Swivels! Lightening Fast Shipping! Gr8 Seller! Gr8 Transaction All Around! 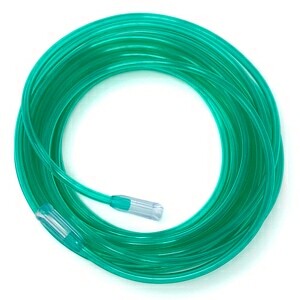 This small connector prevents tiwsting of the oxygen hose. My order was processed quickly and with ease. Delivery was fast and the price was right. Exactly what i wanted. THE AIRLIFE SWIVEL CONNECTORS ARE WELL-MADE & SUBSTANTIAL. THEY SWIVEL OK WHEN HELD IN BOTH HANDS, BUT IN PRACTICE, AT THE END OF A 50 FT. HOSE, THE SWIVEL IS TOO TIGHT AND DOES NOT ROTATE VERY MUCH AT ALL. I'M SURE THEY MUST HAVE LESS LEAKAGE THAN THAN THE FLIMSIER ONES, BUT THEY DO NOT SOLVE THE PROBLEM OF HOSE KINKS. ALSO, WE NEED ONE ON THE CONCENTRATOR END WHICH IS FEMALE TO MALE. This little gadget eliminates the problems caused from walking around and getting your hose tangled. Works slick and doesn't interfere with the oxygen flow! I found the swivel connector very easy to install and it does minimize the "curling" and "tangling" of the oxygen tubing to some extent; but, the reviews I read on the product description page gave me the idea that the curling and tangling of the tubing would be totally eliminated. It's still a big improvement over not having the swivel at all. Maybe I just move around too much. This swivel make it very easy when undoing or coiling my hose. No more fighting to stretch it out and untwisting the hose. This item was exactly what we were looking for ! A swiveling connector. These are stronger than the ones we get from med supply store. Great price, too. Seller was very prompt ! I have not had one (1) kink in my O2 hose since installing the 360 swivel. I would recommend these to everybody on oxygen therapy.